We’re excited to announce a big step towards creating our big goal. As we’ve mentioned before, we have seen that all of the companies using bullet are all interconnected in some way, usually a company member has between 3-6 connections linking it with the next company member. We know that SME businesses rely on one another and we wanted to join the dots. Community is huge to Bullet, we’ve even built our pricing model around it. We like everyone else understand the struggles, learning curves and loneliness that comes with starting or running your own business and we wanted to help people help each other. Bringing our customers questions into the public domain makes it open for everyone to learn, and share, therefore turning a closed knowledge base into a community of learning that others can learn from. There will be no change to the level of support that Bullet currently provides, our customers are the most important thing to us. What if I have a private question? You can select private if there is a question you don’t want to share, and it will be hidden from the community. 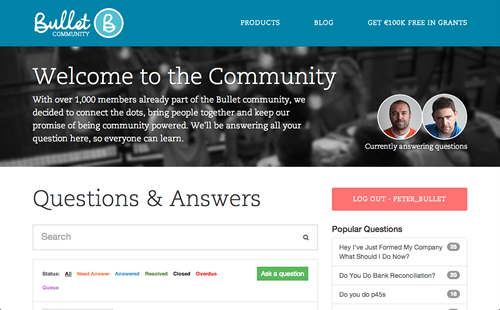 All questions are monitored and answered as fast as we can by Bullet’s staff, but now community members will be able to advise. We noticed we’re getting more and more specific business questions that sometimes we just can’t answer as well as we’d like. If we can’t answer a question well enough, we’ll be inviting experts to answer them. Is this the end of your fast support? Nope, we’ll still be continuing the same level of support, but the experience should be better for everyone. There will be zero tolerance for this. If you find an item that’s offensive that we haven’t picked up, simply flag it and it will be removed until it’s investigated. You can ask any kind of questions once it’s relative to the community. Our community is made up of web savvy makers who are in business, so from developers to filmmakers. Once it’s relative and for the greater good, we’re happy to see it. Absolutely, we’d encourage community managers out here to start discussions. We’ll help with the monitoring and promotion of those discussions. Indeed we’ll be actively looking to encourage this. I have some other questions on this? Great, ask them here so everyone can learn. Ask public or private questions, we’ll answer just like normal! Instant search, animations everyone can see, and popular questions. Add comments and learn from the community, vote on good questions to help others.